The 'little' of this next design is a somewhat agonising choice, such is the variety of brilliant 'little' things on offer to select (a 'we are not worthy' Wayne's World bow to the mini, multiple Marimekko charts), but in the end I decided to focus on the very final feature included in the project. 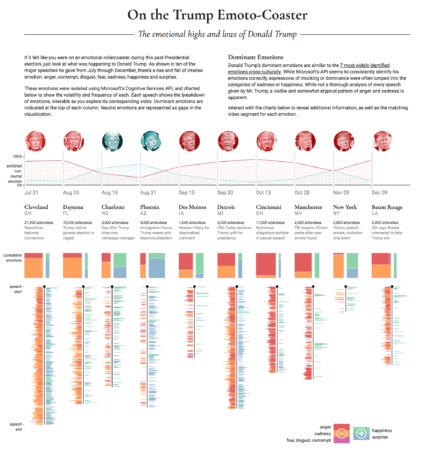 The visualisation work here comes from Periscopic and is a study of the 'The Emotional Highs and Lows of Donald Trump'. The simple thing that just struck a chord with me here - perhaps amplified given the subject matter - is the respect, care and attention given by the creators to equip the audience with comments on the degree of accuracy this data portrays. 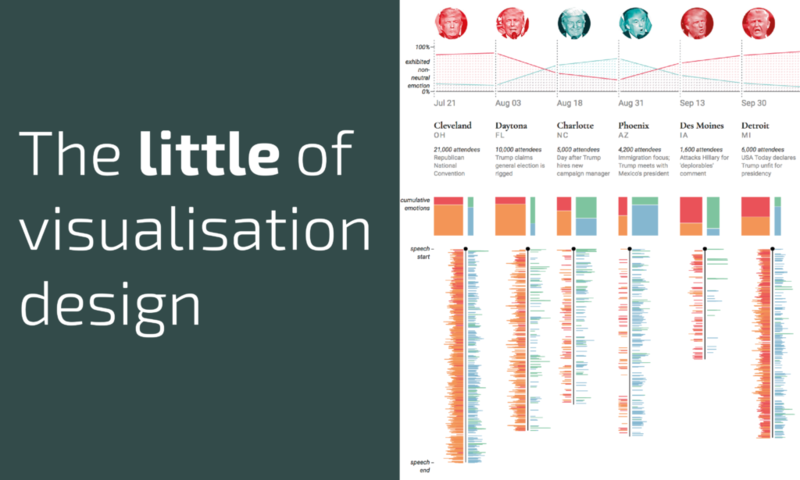 The data plotted is gathered from emotions as analysed and recorded by the Microsoft Emotion API. 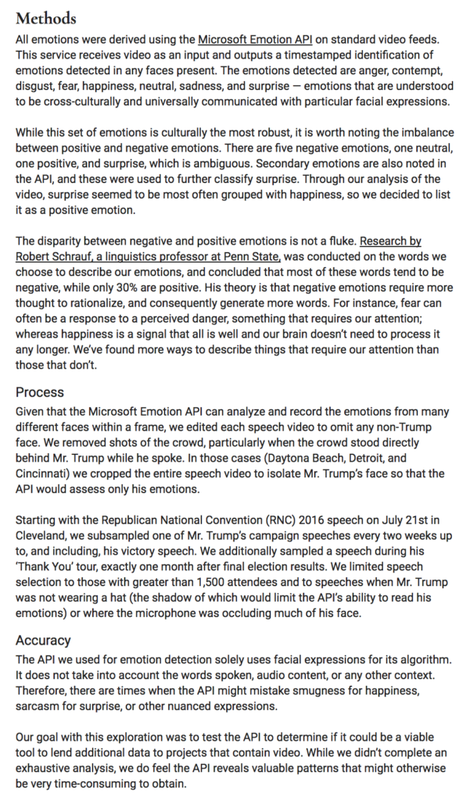 It is an inexact science, a technique still developing in its sophistication but nevertheless it is a worthy approach to automate and summarise the detection of emotion through video, as described in the comprehensive descriptive text. By specifically including the 'Accuracy' statement, the folks at Periscopic demonstrated the first principle (in my view) of good visualisation practice: 'trustworthiness'. This transcends the goal of accuracy in a way because not everything can or will be 100% accurate. This doesn't mean we can't still portray this data, rather it means we have a responsibility to be transparent, equipping an audience with confidence and/or an understanding about what data they are seeing, what shortcomings may exist and advising on the amount of 'pinch of salt' they need to shape any interpretations or conclusions.